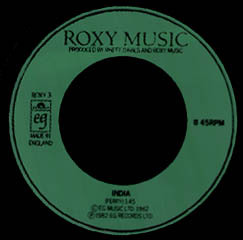 Lyrics to the song India as recorded by Roxy Music. This instrumental track written by Bryan Ferry was used as the b-side to Roxy Music's More Than This single. The track was played through the P.A. at the start of the Avalon tour in 1982 & also the 2011 tour as the band walked on stage, picked up their instruments and started playing along with it.